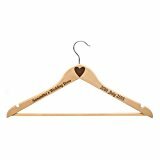 This wooden hanger is the ideal gift for Weddings. Whether for the Bride to hang her dress or the Best Man to hang his suit. Personalise this wooden hanger so that it can be cherished for years to come. Measures approx. 50cm. Use gift message during checkout or contact us through Amazon message to provide your details.